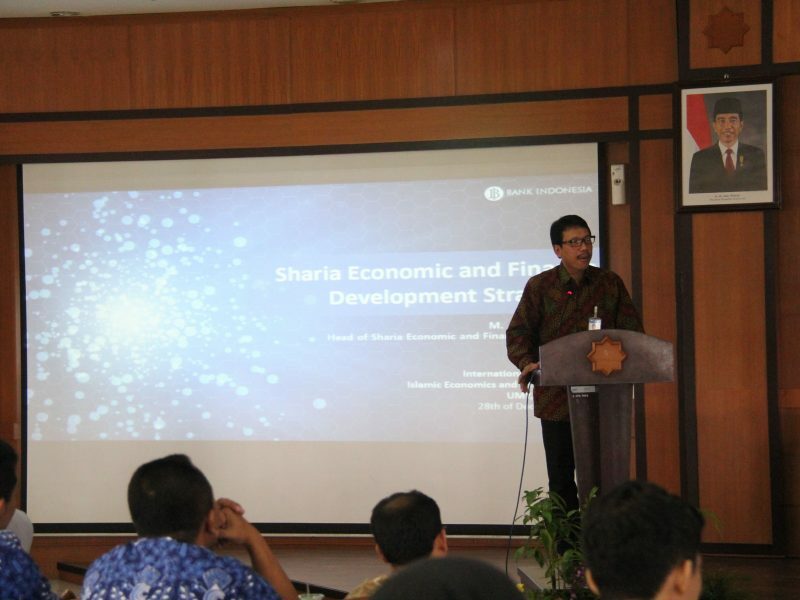 Yogyakarta—Having been designed to enhance the development of Islamic Finance, International Program for Islamic Economic and Finance (IPIEF) is always seeking to adequately address the current situation in Islamic economics. A great deal of efforts initiated by IPIEF, among other things, was hosting Islamic Finance Outlook 2018 on Thursday (28/12), which aims to foresee what challenges may certainly be confronted by Islamic Finance industry in the years ahead. Having taken place in AR Fakhruddin B Building, this conference explored the theme “Strengthening Resilience of Islamic Finance in the Midst of Vulnerability, Uncertainty, Complexity, and Ambiguity (VUCA) World”. 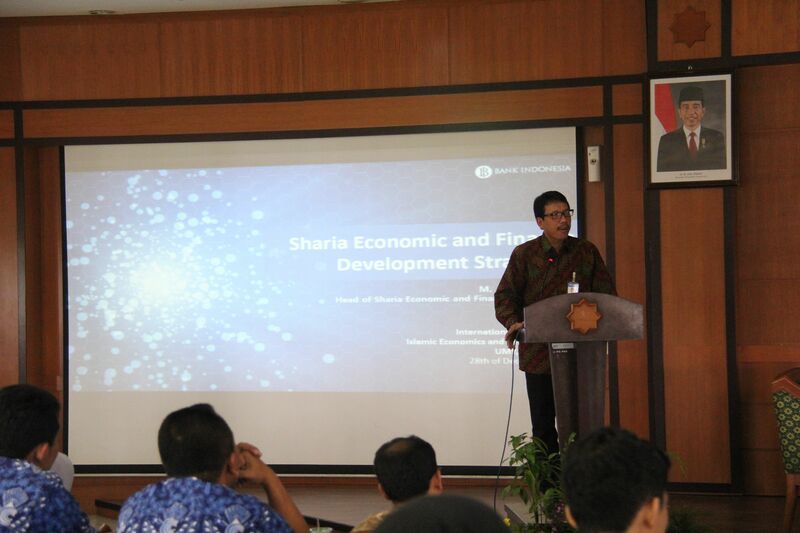 The keynote speech was delivered by Muhammad Anwar Bashori, Head of Sharia Economic and Finance Department, Bank Indonesia (BI). Besides, the speakers are regulators, practitioners, and prominent academia who have a profound understanding, including Deden Firman Hendarsyah, Director of Research, Development, Regulation and Licensing of Sharia Banking, Financial Services Authority (OJK); Arif Yulianto, Head of PBMT Maal Yogyakarta; Rifqi Muhammad, Head of Islamic Micro Financial Institutions Studies, Indonesia Association of Islamic Economist (IAEI) Yogyakarta; Luqyan Tamanni, Director of Islamic Economic Forum for Indonesian Development (ISEFID); Dimas Bagus Wiranatakusuma, Director of International Program for Islamic Economics and Finance (IPIEF); and Fahmia Robiatun NB, Researcher of FOSSEI Yogyakarta. Muhammad Anwar Bashori stated in his speech that the world has changed because of industrial revolution 4.0, as can be seen from the digitalization of our daily life that fundamentally altered the way the people live, work, and has always been associated with unprecedented scale, scope and complexity, known later as VUCA. VUCA has been reinforced mutually by the rapid development of many financial advanced technologies such as Go-Jek in Indonesia and Alibaba.com in China. VUCA world is now happening and we have to adapt with this latest technology. “Islamic finance which should be rested on sharia-teachings seems to be having the valuable opportunity to expand dramatically since the nature of Islamic finance is basically in line with the changing world owing to its flexibility, and hence can be stable from VUCA. Given the fact that the world we are living in today has changed, the traditional understanding of Islamic finance should also be broadened. The common opinion stating Islamic economics has solely been represented by Islamic banks is not relevant anymore as there are many instruments from Islamic social finance consisting of zakah, infaq, shadaqah and waqf as well as Halal industry on which many countries Japan, Thailand, South Korea and Australia have been focusing its current economic sectors, which have yet to be discussed and promoted when talking about Islamic economics,” said Anwar. He also added that to safeguard the system by mitigating the loss because of VUCA effect, reduce income inequality that might result from industrial revolution 4.0, Islamic social finance can play a prominent role in achieving such crucial objectives. Explaining the current development of both global and Asian Islamic finance, Deden stated that Islamic banking in Indonesia is the second largest Islamic banks in Asia, after Malaysia, based on total assets of two largest Islamic banks. “Financial Services Authority, therefore, has Islamic Finance Priority Programs in 2018, which entail the improvement of Sharia banking marketing strategy, developing the variations of products, Islamic mutual fund, Hajj fund management through Sharia Capital Market, establishing university-based Sharia Financial center as a lab, development of Islamic financial technology and promoting Islamic finance’s contribution to provide funding sources,” Deden added, emphasizing the priority program of OJK in the next year.